1.2 What is considered to be “normal body temperature”? 1.3 What and when you should act as a parent? 2 Your baby is sick with fever? When you should see a doctor? 3.2 Benefits of a continuous temperature curve. 4.1 What it is a febrile seizure and what does it mean? I am Greta. I am a mother of three. Today I would like to share with you my thoughts on fever in children, febrile seizure and the story of my daughter. One day our 3-year old daughter suffered from a viral infect causing high fever that suddenly led to a febrile convulsion. I sat at her bed, taking the temperature every hour. But still I could not see the seizure coming. Here is what I learned: The reason for a febrile convulsion is not the absolute height of the temperature, but the fast rise of it. This incident didn’t let me rest. As I recognised that febrile convulsions are quite frequent and not just an incident in our family we bet everything on finding a perfect solution for this problem. Parents should be able to continuously see what is going on with their kids. They should be able to see the whole temperature curve of their child during fever in order to be able to manage fever more relaxed and without stress. You might know what I am talking about. You wake up in the middle of the night. Your kid is crying and seems to be in serious pain. You notice that her forehead is hot. You take her temperature and guess what? The temperature is reading is higher than normal. Your natural reaction might be: let’s call a doctor. But in most cases here’s what experts say you should do instead: Take a deep breath and relax. Easier said than done. Many parents freak out when their child’s body temperature spikes. This is understandable. 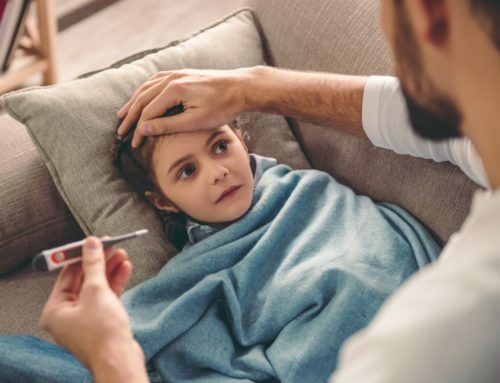 Almost 30 percent of pediatric acute-care visits are related to fever, according to a study published earlier this year in Pediatrics in Review. According to Robert W. Steele, M.D., a pediatrician at St. John’s Children’s Hospital, in Springfield, Missouri. “a lot of parents think a fever is really dangerous“. But in the most cases, fever is nothing really to worry about. In some sort of way, having a fever is a good thing. It means that your child’s immune system is doing its job by fighting an underlying cold or another infection. The brain asks the body’s temperature to rise. This directs the white blood cells to attack and destroy invading viruses and bacteria. What is considered to be “normal body temperature”? This chart tries to provide a range of temperatures that are considered to be “normal body temperature ranges” depending on age. As you can see, the differences are not that big. Which means that precisely measuring a body temperature might be rather important. Having 100.00 or 100.5°F does matter for kids at the age of 3 to 10 years. But it is not only about precision of measurement at the right place (where taking the temperature). It is also about “trends”. Is the temperature on the rise? Is it dropping off? You might not feel small temperature changes directly on the forehead. However, if you had a continuous measurement device, you can instantly see which direction the temperature is going. In case it is rapidly going up, you can make sure you know what to prepare for (e.g. either call a doctor or prepare some calf treatment). If temperature stabilizes or is even going down, you can be sure that the peak is already in the past. What and when you should act as a parent? 3 months or less: anything above 100.4°F asks for a quick call to your local doctor. An infant’s immune system at this age isn’t fully developed. An infants is still vulnerable to potentially life-threatening infections like bacterial meningitis and pneumonia, and an elevated body temperature is often the only symptom. Between 3 and 6 months: your child needs to be examined by his pediatrician once his fever hits 101°F. Older than 6 months: you can typically wait to contact your doctor until your child’s temperature rises to 103°F. When your child is having a fever, this is typically a sign that something is not 100% ok with your child. If your child has a runny nose and a low-grade fever (under 101°F), it usually means there is a common cold. However, vomiting or diarrhea could probably point to a stomach virus. In both cases, the fever tends to come on gradually and to disappear within a few days. So as long as you have your temperature under control, you are on the right path to properly take care of your kid. Always keep in mind: providing medication is a good thing to help your child feel better immediately. However, providing medication just hides the fever. It does not cure the fever. 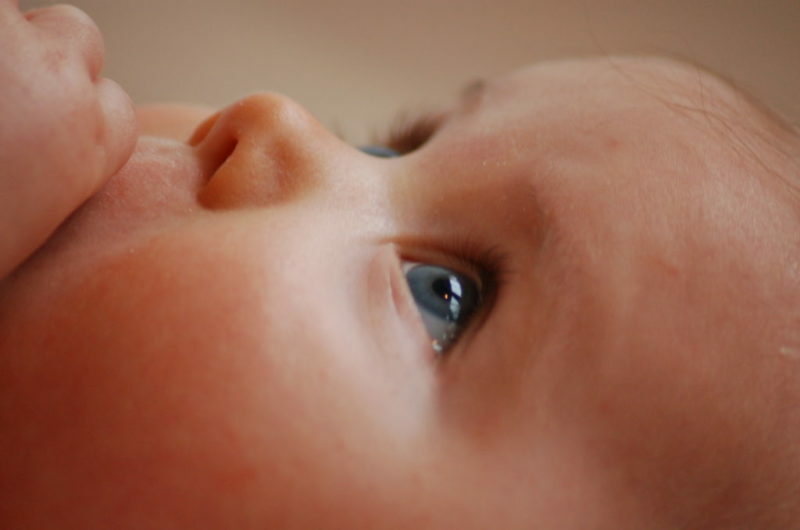 Have a close look at how temperature evolves in your child’s body and focus on the way your child looks, feels, and acts. (go to: degree° – continuous thermometer) If your child has fever, but is still happily running around, it is ok. There is nothing serious to worry about. However, besides medication there are other approaches to bringing down fever. A lukewarm bath, working with washcloth or calf packing may also temporarily cool your child off. Do not use cold water or ice baths, though. They’ll make your child shiver, which can raise his temperature even higher afterward. Provide your kids with lots of fluids which will help the body battling the illness and keep your child hydrated. Keep your child in light, breathable and comfortable clothing. Dressing your child in layers helps a lot because exchanging layers due to sweating is easier. Your baby is sick with fever? When you should see a doctor? When a healthy baby gets sick, don’t panic. Understand when to call the doctor, what complications can occur and when to seek emergency care for your baby. Having a baby means occasional infections and fevers are coming regularly. This is normal. But even you as a parent with experience with sick babies can have trouble distinguishing normal fussiness and mild illnesses from serious problems. Appetite: does your baby refuse feedings or eats only very poorly? There might be something going on. Behavior: If your baby is hard to awaken or unusually sleepy, tell the doctor right away. Temperature: have a regular look at your child’s temperature. If your baby is younger than 3 months old, contact the doctor for any type fever. You do not need to see him right away, try to have a phone call with him first. If your baby is 3 to 6 months old and has a temperature up to 102 F (38.9 C) and seems sick or has a temperature higher than 102 F (38.9 C), contact the doctor. With a child that’s 6 to 24 months old and has a temperature higher than 102 F (38.9 C) that lasts longer than one day but shows no other signs or symptoms, contact the doctor. If your baby has a fever that lasts for more than 3 days, contact the doctor. Diarrhea: If your baby’s stools are especially loose or watery, think about talking to a doctor. Vomiting: Your baby is occasionally spitting up and the flow of stomach content through the mouth is rather forceful? Go and see a doctor if your baby vomits forcefully after feedings or your baby hasn’t been able to keep liquids down for eight hours. Dehydration: Your baby cries with fewer tears, has significantly fewer wet diapers or has a dry mouth, have a chat with your doctor. Also, if your baby’s soft spot appears sunken. Constipation. If your baby has fewer bowel movements than usual for a few days and appears to be struggling or uncomfortable, contact the doctor. Colds. Contact the doctor if your baby has a cold that interferes with his or her breathing, has nasal mucus that lasts longer than 10 to 14 days, has ear pain or has a cough that lasts more than one week. Rash. Contact the doctor if a rash appears infected or if your baby suddenly develops an unexplained rash — especially if it’s accompanied by a fever. Eye discharge. If one or both eyes are red or leaking mucus, contact the doctor. In any case. If you do not feel well. If you do think you must see a doctor rather sooner than later, then just do it. There is no need to to artificially wait. Fever in children is common. It is not unusual. In contrary, it is a natural reaction by your baby’s body. Usually, fever and febrile convulsions are to a certain extent not dangerous. Febrile convulsions are particularly challenging, since temperature rises very quickly. Fever does not always mean a child is seriously ill. It just means, that the child’s body is reacting to an inflammation or an infection. As the number one key indicator, have your child’s body temperature in mind an under control. Measure it as continuously as possible. Accuracy and convenience are essential to a continuous monitoring of your child´s body temperature during fever. So far, medical thermometers are not offering both necessities. 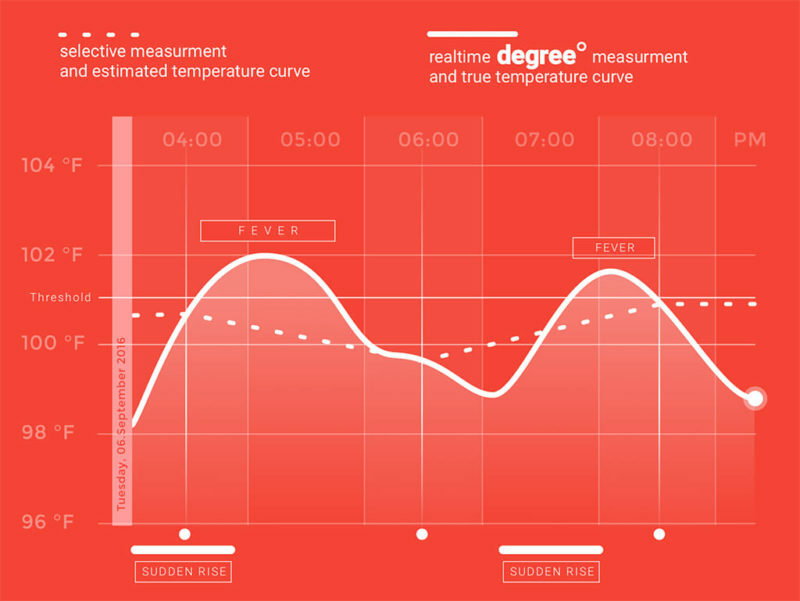 degree° is giving you the confidence you need in times of fever. 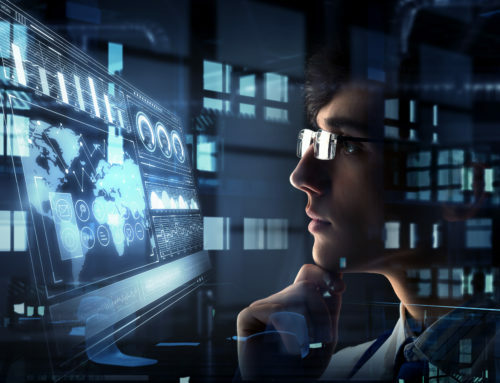 Make decisions based on real, measureable and reliable data. Measuring body temperature seems to be a simple and standard task. However, today’s technologies provide various approaches to temperature measurement. They may be technically accurate but enable only a one-time measurement and are uncomfortable. thermometers are, despite the fact that they are widely distributed, very difficult to use properly. If the infrared light does not hit the eardrum the values are highly inaccurate. Also, it just enables a one-time measurement, too. One-time measurement makes it difficult to track down febrile seizures. degree° is a major industry breakthrough giving you the confidence you need in times of fever. 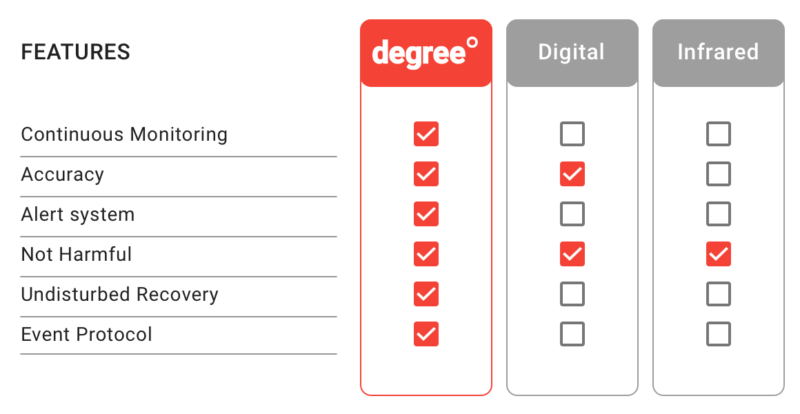 With degree° you can make decisions based on reliable data. Accuracy and ease of use are essential to a continuous monitoring of your child´s body temperature. With digital thermometers you can only take selective measurements. The results always differ and the procedure can be unpleasant depending on where you take the temperature. Using infrared thermometers, you get various results with various handling depending on where the light hits the skin. degree° takes the temperature reliable from always the same spot which was validated in empiric studies. degree° is the thermometer giving you the core body temperature with a comfortable and steady quality. You can wear it 24/7 and be sure to be as accurate as ± 0.2°F (±0.1°C). Benefits of a continuous temperature curve. If your child´s body temperature is rising or falling in any moment. The exact effects of your treatment with either homespun remedies or medication. The time until temperature starts to drop after a treatment. Fast rises in temperature possibly indicating a febrile convulsion. The body’s own temperature sensor, the hypothalamus, is located in the brain region near the ear drum. Thus, taking the temperature in the ear you see the same temperature than your body´s regulating system. degree° is using a patent pending and medically recognised technology to take your child´s body temperature inside the ear canal. This region is the most responsive to temperature changes. degree° is taking the temperature in the ear canal with a technical accuracy of ± 0.2°F (±0.1°C.) This measuring place is medically approved and is known to have the following normal temperature ranges: 97.7°F – 99.5°F (36.5°C – 37.5°C). What it is a febrile seizure and what does it mean? The rise of a child’s or infant’s body temperature can cause a febrile seizure, or febrile convulsion. This might be due to an inflammation or an infection. Typically, children under 6 years who have a temperature of 38° Celsius or more are affected. It is mostly common between 6 months and 5 years. In total, up to 5 percent of all kids experience a febrile convulsion before they are 5 years old. Seizures can look alarming to parents. They even frighten us. Professionals talk about a febrile seizure, when a child shows a high temperature where there is no clear cause or previous diagnosed neurological or developmental issue. In more than 90% of the cases, child’s do show only a simple febrile seizure. A child’s rising body temperature is the key driver of febrile seizures. They typically occur during the first day of the fever. Sometimes kids show them as well when a high body temperature is eventually coming down. Typical infections causing febrile seizures do include but are no limited to gastroenteritis, tonsillitis, a urinary tract infection. Very serious infections that cause a febrile seizure are infections of the central nervous system. The infection affects the brain and the spinal cord. Such rather serious infections include encephalitis or meningitis. Seizures linked to these conditions may have a more serious cause. Place your child in the recovery position. This means placing it on the side with face turned to one side. This action typically stops them from swallowing any vomit. Airways will be kept open and in doing so you can prevent additional injury to occur. If possible, take your time and stay with the kid during hat febrile seizure. Continuously monitor the body temperature (go back to: degree° – continuous thermometer). Try to apply different approaches to cool your child off. While cooling it off, have a look at how the temperature unfolds. As soon as you see the temperature either stabilizes itself or is coming down, then you know, you are on the right track. If the seizure takes longer than 5 minutes, consider calling a doctor. If it lasts longer than 10 minutes, consider calling an ambulance or seeing the next hospital. Even though it might probably not be serious, it is a sensible precaution. It does not happen very often, but when the seizure continuous for a long time, a (hospital) doctor may give medication to stop the seizure. In such cases the infection appears to be a serious one and the child should be kept under professional observation. Having a fever is actually a good thing for children. It helps your child get rid of some sort of inflammation or infection. However, it is important that you have your child’s temperature in mind. Continuously controlling whether your child’s body temperature goes either down or up provides you with a lot of stability to decide which steps to take. With continuous temperature measurement you are always informed whether or not your child’s temperature is skyrocketing. Once it is, you know it and you have the time to react to protect your kid. My nephew had a seizure and afterwards he is lathargic. Took him to emergency room. They took blood and sent us to TC Thompson’s children hospital. When we arrived within a few minutes he was released. We are very concerned because he still isn’t talking. He seems very disoriented. ??? I’m sorry but we can’t help you in this special case.